You now have before you the work of the bright minds who came to the Rethinking Stewardship conference held at Luther Seminary in St. Paul, Minnesota in July 2010 and wrote something about stewardship. As one would expect, the essays in this volume are disparate in tone and genre. Some read like standard theological essays, some more like sermons, and others read a bit like the transcripts of speeches. There is no stewardship model here for you to implement, no canned sermons for you to deliver. Rather, the essays are seeds. The ideas and questions contained in them are meant to take root and grow in your own mind and life. We trust—like the original 400 conference attendees—that the thoughts that these thinkers have provided will assist you in the difficult theological task of rethinking stewardship. 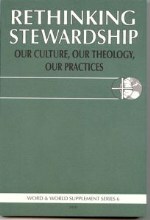 Rethinking Stewardship: What Do I Own, and What Owns Me?